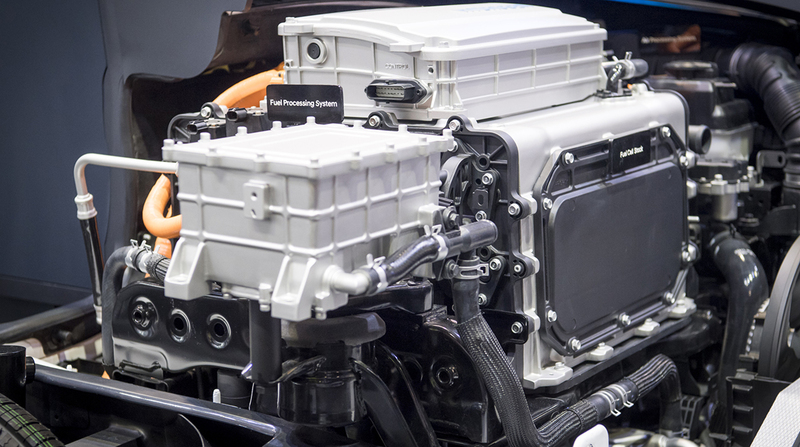 Hyundai Motor Group and its suppliers plan to spend $6.7 billion (7.6 trillion won) through 2030 to raise production of fuel cells more than 200-fold as the South Korean automaker targets becoming a key player in new-energy vehicle technology. The world’s fifth-largest auto group — with Hyundai Motor Co. and Kia Motors Corp. under its umbrella — said Dec. 11 it will boost annual production capacity of fuel-cell systems to 700,000 units from 3,000 now and create 51,000 jobs over the next 12 years. The spending proposal reaffirms Hyundai’s faith in the future of a technology that’s been derided as “mind-bogglingly stupid” by Elon Musk, chief executive officer of Tesla Inc., which makes battery-powered cars. Fuel-cell technology, which has been championed by Toyota Motor Corp. as an alternative to the conventional internal combustion engines, involves hydrogen-powered vehicles that emit only water vapor. Hyundai has South Korea’s backing in its bets. The government plans to roll out 4,000 fuel-cell electric vehicles on the road next year, a fivefold increase, with an aim of establishing 310 hydrogen stations in South Korea by 2022. The automaker has been wanting to bring its FCEVs to China and exploring options to utilize hydrogen-powered cars for a mobility service, although specific plans have not been announced yet. Hyundai aims to produce 500,000 units for fuel-cell powered passenger and commercial vehicles, while 200,000 units will be produced for other industries such as drones, vessels and rolling stocks. Hyundai Motor Group held a groundbreaking ceremony Dec. 11 to build its second fuel-cell system factory in Chungju, South Korea, which will increase fuel-cell system output to 40,000 units a year by 2022. The carmaker, in collaboration with Aurora, a startup formed by former executives from Google, Tesla and Uber Technologies Inc., is currently testing its fuel-cell sport utility vehicle NEXO, which has a maximum range of 370 miles for autonomous driving. “We are confident that hydrogen power will transcend the transportation sector and become a leading global economic success,” Hyundai executive vice chairman Euisun Chung said in a statement. The company said in September it will sell 1,000 fuel-cell electric trucks between 2019 and 2023 in Switzerland and announced a collaboration with Volkswagen AG’s Audi in June.